In order to create a successful web page, a company has to find out how their service/product can stand out from the rest of the crowd. How can we attract potential customers? What makes our product more unique than others? Why would customers rather choose our product compared to others? These questions should be answered somewhere on the landing page in form of the following points . Most of the time, a hero shot is represented by a big picture that is added to the landing page to arouse attention. However, not only pictures can be used, also video clips can be a further possibility. But which criteria should a suitable picture fulfill? A hero shot should excite customers curiosity, appear positive, and the target group should be able to identify themselves with the picture/video. It is also important to keep in mind that the hero shot orientates itself towards the AIDA- principle (Attention/Interest/Desire/Action). 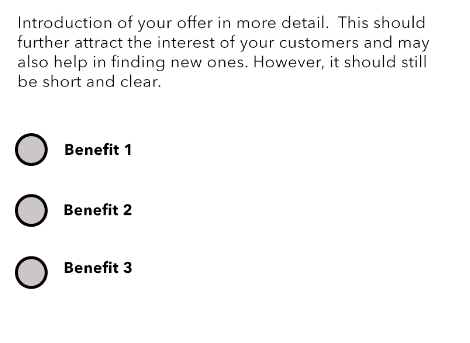 Many companies don’t understand that giving away too much information about their offer can also result negatively. Customers do not want to be bombarded with detailed background stories. Customers require fast and obvious benefits of each product. It is comparable to asking someone how he/she is doing and the answer is a detailed medical history instead of an ‘I’m doing great’. Companies should try to answer these certain questions: What does this product/service actually do? How do we expect people to use this? How easy or quickly can the benefits be realized? The benefits and features should be inserted as followed below. To arouse even more attention from customers for the landing page, companies should insert one or two social proofs. They can choose between various social proof options. A landing page without an effective call-to-action will never be as successful as initially hoped. The call-to-action is the most important step in the customers buying process. To create effective call-to-action companies must consider various points. Design: The call-to-action element should be big enough for customers to recognize it easily. 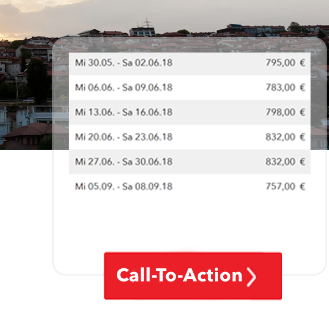 Some landing pages use a call-to-action element with the same width as the page itself. Message: Companies should choose wisely which text should be shown to their customers. The message should be clear, not too long and inform customers what they are supposed to do. Placement: Often customers leave landing pages because they are not able to find the call-to-action. If the CTA is inserted below the fold fewer people will click the action button. The reason for that is that many people do not want to read the whole web-page site or even leave before scrolling around. The CTA should be easily recognizable and can be inserted several times on a page. Testing: In order to ensure the usability of the CTA it is always a good idea to test it before publishing it (most platforms for building landing pages even allow A/B testing complete landing pages). In order to create a successful landing page people should keep these 5 elements in mind . Potential customers want to get important information quickly, without having to read too much detailed background stories. Customers also want to be further interested in the product/service and require a clear interface. There are different programs that allow you to easily create a good-looking landing page. One tool I can definitely recommend is called Elementor. If you need some further inspiration before realizing your landing page you can also have a look at some templates from Unbounce.